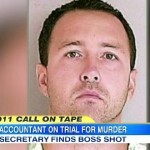 Dan joined Robin Roberts on Good Morning America, Monday, July 14th to discuss the murder trial of Andy Brown. Brown is an accountant from Michigan charged with shooting and killing his boss, 70-year-old David Locey, who had allegedly caught him embezzling money. Brown lost his accounting license after being convicted in 2005 for embezzlement but Locey was giving Brown another chance by hiring him. A 911 call made by the secretary who discovered Locey was played for the Michigan jury deciding Brown’s fate and provided some interesting details. In the call, the secretary states that Locey and Brown had an argument the previous day and suspected Brown to be the culprit. Investigators found gunshot residue on Brown’s clothes, however, no gun was found and Brown has pleaded not guilty. Says Dan, “This is not an easy case. There’s a lot of evidence that makes it look like he could have done it. The motive, the gunshot residue, cell phone records, in this case. But there is no DNA. No blood. There is this a mysterious footprint out there. And so I think it’s possible that you have some jurors focusing on that legal standard of beyond a reasonable doubt and saying, wait a second, even if we think he did it, maybe that’s not enough to get proof beyond a reasonable doubt.” Watch the full clip here.